Apostasy is the denunciation of a religious belief. It’s a pejorative term used by the religious institution that’s been left behind. 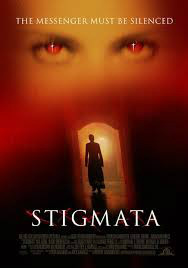 In Stigmata, we see Gabriel Byrne (who last week we saw play the Devil in End of Days!) play a priest who is also a scientist whose job is to debunk religious claims of miracles. 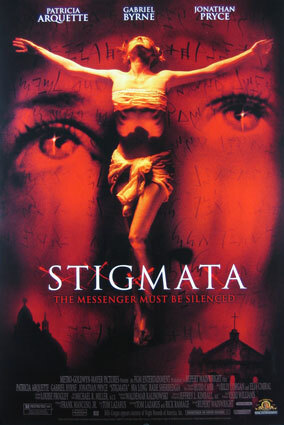 He is sent to investigate Frankie (played by Patricia Arquette) who has allegedly been receiving the “gift” of the stigmata wounds – the five wounds Christ received while he was crucified. At first it doesn’t seem to fit because Byrne’s character explains that the stigmata is only ever given to those who are deeply devout believers and Frankie is a proclaimed atheist. But they keep coming and coming until they reveal a plot that threatens the very authority and existence of the Catholic church…and THAT’s why this narrative is such a big deal. It seems Frankie is channeling a new gospel that are supposedly the direct words of Jesus, and they’re basically saying…”You don’t need buildings to worship God. You can do it on your own directly person to deity.” Well, that goes completely against the Catholic’s gig of interceding on sinners’ behalf to God. While this may not seem so Earthshattering to a modern receiver of this narrative, it would completely render the whole Catholic belief system obsolete. And if there’s one thing the Catholics have fought throughout history…it’s their own obsolescence. There’s no great conspiracy here. It’s just God saying, “Hey, I’m everywhere. I’m in you! You can worship me anywhere.” This calls to mind when Robinson Crusoe was first published. It caused a great big stir in religious circles and they even tried to ban it because here was this character stuck on an island for year and years who comes to figure out for himself that he can have a relationship with God directly. He doesn’t need a big church to do it for him. Nature is his church. You can imagine how that played out in 1719! (BTW The original title of Defoe’s book has to win the longest title prize: The Life and Strange Surprizing Adventures of Robinson Crusoe, Of York, Mariner: Who lived Eight and Twenty Years, all alone in an un-inhabited Island on the Coast of America, near the Mouth of the Great River of Oroonoque; Having been cast on Shore by Shipwreck, wherein all the Men perished but himself. With An Account how he was at last as strangely deliver'd by Pyrates) Throw that one out at your next game of Charades! When you've just had enough and decide to leave your religion behind.